Julia is a free open source, high-level, high-performance, dynamic programming language for numerical computing. It has the development convenience of a dynamic language with the performance of a compiled statically typed language, thanks in part to a JIT-compiler based on LLVM that generates native machine code, and in part to a design that implements type stability through specialization via multiple dispatch, which makes it easy to compile to efficient code. In the blog post announcing the initial release of Julia in 2012, the authors of the language—Jeff Bezanson, Stefan Karpinski, Viral Shah, and Alan Edelman—stated that they spent three years creating Julia because they were greedy. They were tired of the trade-offs among Matlab, Lisp, Python, Ruby, Perl, Mathematica, R, and C, and wanted a single language that would be good for scientific computing, machine learning, data mining, large-scale linear algebra, parallel computing, and distributed computing. The designers of the language and two others founded Julia Computing in July 2015 to “develop products that make Julia easy to use, easy to deploy, and easy to scale.” As of this writing, the company has a staff of 28 and customers ranging from national labs to banks to economists to autonomous vehicle researchers. 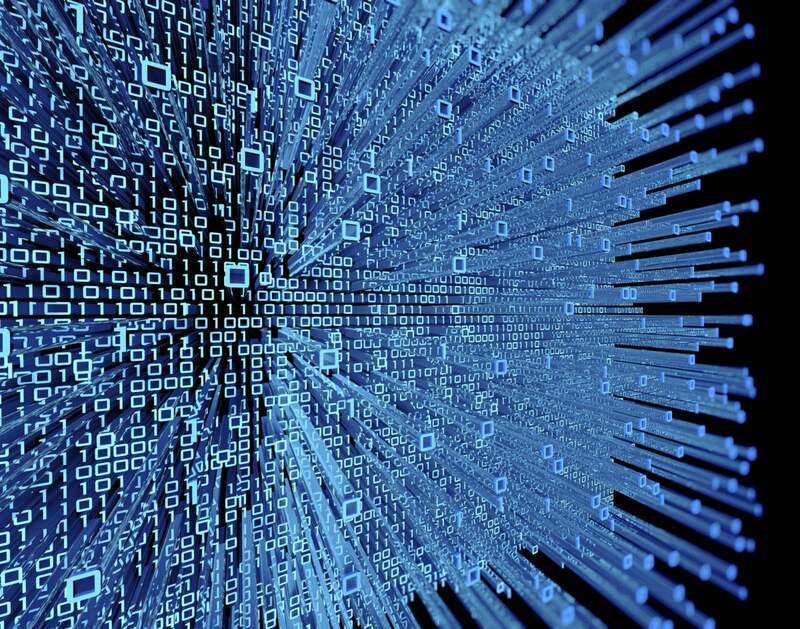 In addition to maintaining the Julia open source repositories on GitHub, Julia Computing offers commercial products, including JuliaPro, which comes in both free and paid versions. The figure above shows performance relative to C for Julia and 10 other languages. Lower is better. The benchmarks shown are very low-level tasks. The graph was created using the Gadfly plotting and data visualization system in a Jupyter notebook. The languages to the right of Julia are ordered by the geometric mean of the benchmark results, with LuaJIT the fastest and GNU Octave the slowest. 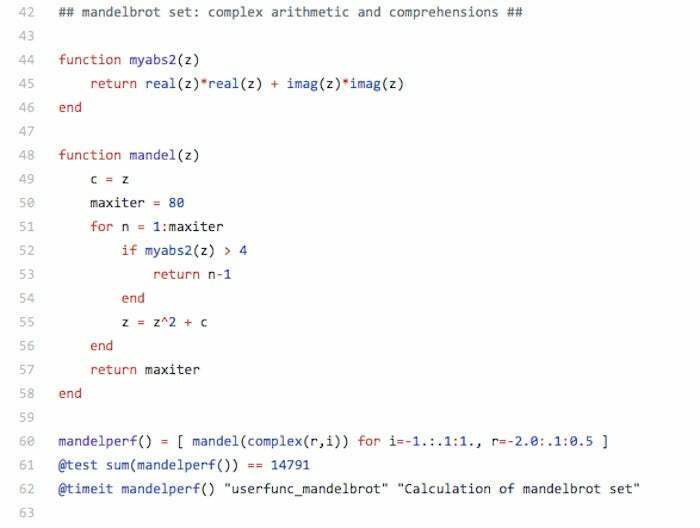 Julia fans claim, variously, that it has the ease of use of Python, R, or even Matlab. These comparisons do bear scrutiny, as the Julia language is elegant, powerful, and oriented towards scientific computing, and the libraries supply a broad range of advanced programming functionality. If you don’t need to run on multiple cores, you can utilize lightweight “green” threading, called a Task() in Julia and a coroutine in some other languages. A Task() or @task works in conjunction with a Channel, which is the single-process version of RemoteChannel. Here we are asserting an incompatible type the first time, causing an error, and a compatible type the second time. Julia has efficient support for Unicode strings and characters, stored in UTF-8 format, as well as efficient support for ASCII characters, since in UTF-8 the code points less than 0x80 (128) are encoded in a single character. Otherwise, UTF-8 is a variable-length encoding, so you can’t assume that the length of a Julia string is equal to the last character index. 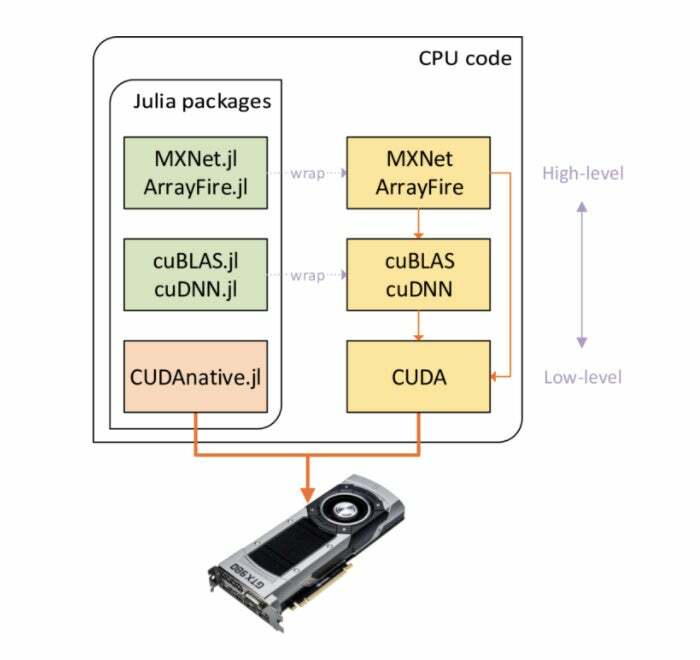 Julia has GPU support using, among others, the MXNet deep learning package, the ArrayFire GPU array library, the cuBLAS and cuDNN linear algebra and deep neural network libraries, and the CUDA framework for general purpose GPU computing. The Julia wrappers and their respective libraries are shown in the diagram below. You can download the free open source Julia command line for Windows, MacOS, generic Linux, or generic FreeBSD from the Julia language site. You can clone the Julia source code repository from GitHub. 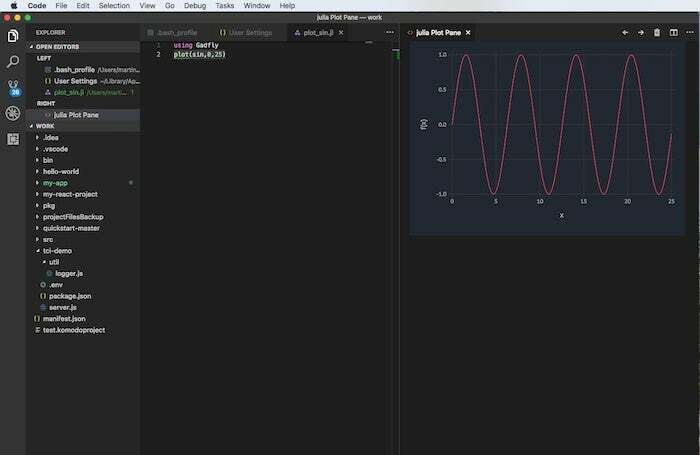 Alternatively you can download JuliaPro from Julia Computing. 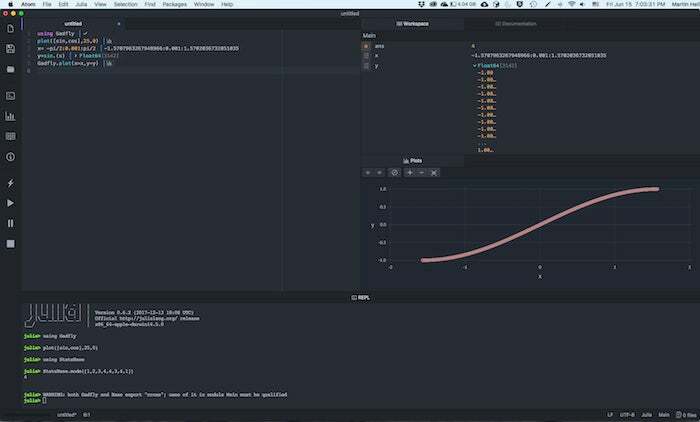 In addition to the compiler, JuliaPro gives you the Atom-based Juno IDE (shown below) and more than 160 curated packages, including visualization and plotting. 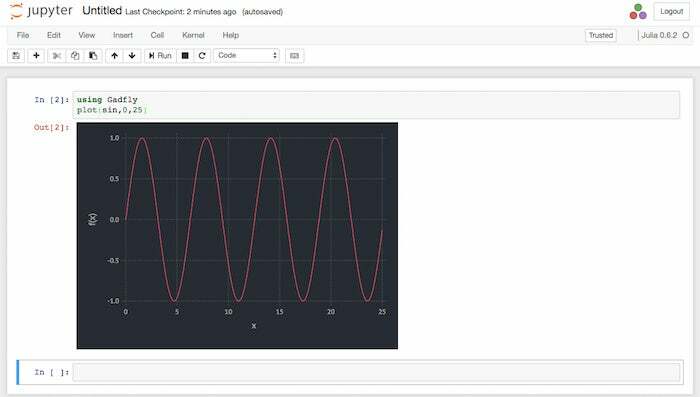 You can run Julia in Jupyter notebooks online using JuliaBox (shown below), another product of Julia Computing, without doing any installation on your local machine. JuliaBox currently includes more than 300 packages, runs Julia 0.6.2, and contains dozens of tutorial Jupyter notebooks. 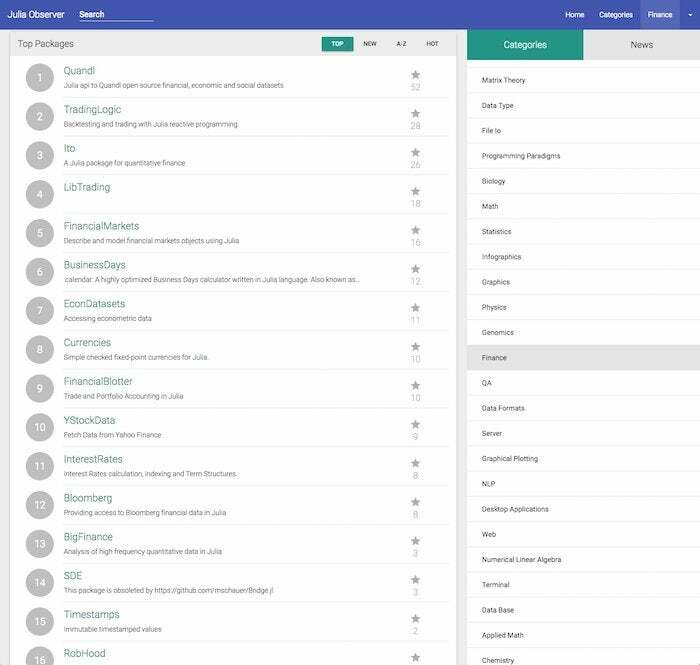 The top-level list of tutorial folders is shown below. The free level of JuliaBox access gives you 90-minute sessions with three CPU cores; the $14 per month personal subscription gives you four-hour sessions with five cores; and the $70 per month pro subscription gives you eight-hour sessions with 32 cores. GPU access is not yet available as of June 2018. 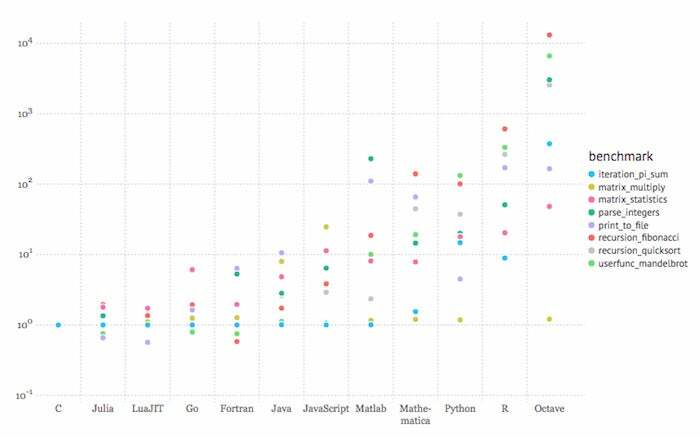 Julia “walks like Python, but runs like C.” As my colleague Serdar Yegulalp wrote in December 2017, Julia is starting to challenge Python for data science programming, and both languages have advantages. As an indication of the rapidly maturing support for data science in Julia, consider that there are already two books entitled Julia for Data Science, one by Zacharias Voulgaris, and the other by Anshul Joshi, although I can’t speak to the quality of either one. If you look at the overall highest-rated Julia packages from Julia Observer, shown below, you’ll see a Julia kernel for Jupyter notebooks, the Gadfly graphics package (similar to ggplot2 in R), a generic plotting interface, several deep learning and machine learning packages, differential equation solvers, DataFrames, New York Fed dynamic stochastic general equilibrium (DSGE) models, an optimization modeling language, and interfaces to Python and C++. 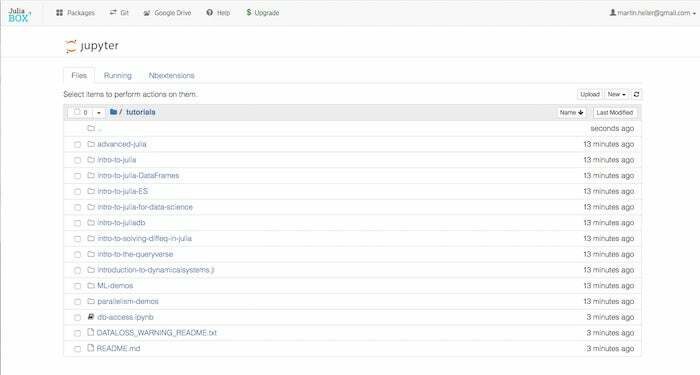 If you go a little farther down this general list, you will also find QuantEcon, PyPlot, ScikitLearn, a bioinformatics package, and an implementation of lazy lists for functional programming. Quants and financial analysts will find many free packages to speed their work, as shown in the screenshot below. 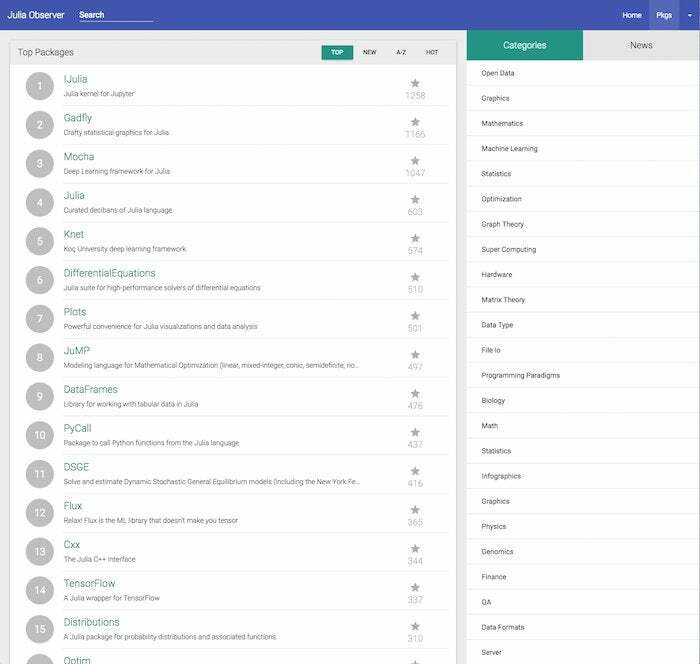 In addition, Julia Computing offers the JuliaFin suite, consisting of Miletus (a DSL for financial contracts), JuliaDB (a high performance in-memory and distributed database), JuliaInXL (call Julia from Excel sheets), and Bloomberg connectivity (access to real-time and historical market data).